Last night I went to a couple more things at the Book Festival – not necessarily the sorts of things everyone was tweeting about (on my feed the James Tait Black Prize for Fiction was the highlight) but things that were of particular interest to me as a sometime journo and history student. 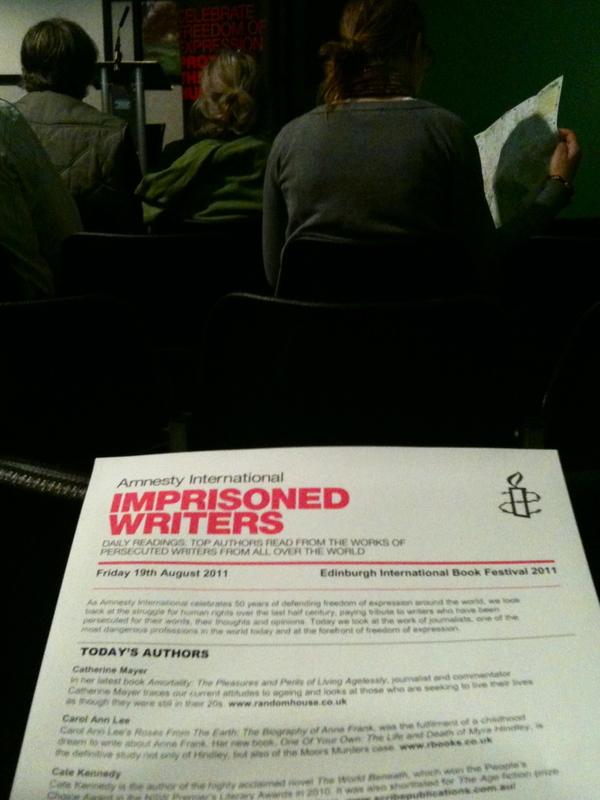 The first was a reading in the Amnesty International Imprisoned Writers series, focusing on the work of journalists Anna Politkovskaya, Hollman Morris, Marielos Monzon and Mohamed El Dahshan who variously reported conflict in Chechnya, Columbia, Guatemala and Egypt and have all been threatened (and much worse) by their governments for trying to tell the story of what has gone on in these countries. As the first reader, journalist Catherine Mayer pointed out, these people do the kind of work that makes idealistic young folk want to get into journalism – there’s a level of integrity and courage involved in some areas of the profession that people forget about in the face of events like the phone hacking scandal. There were some scary statistics read out – 2000 journalists have been killed in the line of duty over the past 20 years, 94 in 2010 – and last year 89 countries put restrictions on freedom of expression. Sort of puts things into perspective, doesn’t it. I studied Modern History at university, in no particular order. In the first year of honours I did Imperial Russia and British Empire in India first semester, followed by JFK and Political Culture in Postwar European Democracies in the second. In my final year my specialist subject was British Cinema History 1920 – 1960, I wrote a dissertation on the portrayal of African Americans by Hollywood during the Civil Rights movement in the 50s and 60s (an enormous topic which my supervisor despaired of and ultimately refused to help me with); and a module called The Life of the Mind: Key Texts in Early European Thought (which included Hobbes, Machiavelli, Grotius etc). The fact I didn’t do these in any particular chronological order didn’t prevent me from getting a 2:1, just as the fact the Horrible Histories TV show presents information out of order didn’t stop them getting a BAFTA. What I’m saying is, I disagree with Gove. The panel actually differed from me in that sense, on the grounds that a chronological framework makes it easier for children to piece things together. Professor Linda Colley pointed out that schools jump from Tudors and Stuarts to World War II in quite an alarming way, which I do remember happening when I was in primary 7 – but that didn’t mean I was under the impression nothing happened in between. I haven’t thought about it a great deal but if pressed I would hazard a guess teachers do this because there’s something in both of those for kids to get a handle on. Tudors and Stuarts seems like a fairytale, with castles and princes and quests and stuff, you know how to relate to that cause most kids have heard fairy stories or been to Disneyland or Elcho Castle or wherever. Meanwhile WW2 is something that happened when your granny was alive, which makes it sort of easier to process – the fact my gran could tell me stories about when she was evacuated made it a lot more real. In fact if they’d tried to force the Industrial Revolution on me at that point, rather than sensibly waiting till Standard Grade, I think it might have irrevocably damaged my interest in the subject. Anyway the debate wasn’t so much focused on the pros and cons of chronological teaching as the “island story” idea, which is a silly one for a few reasons but not least because the story is different in different bits of the UK – the north of England differs from the south in the same way there’s a Scotland / England divide and so on. The panel seemed unanimous that the idea of one single national curriculum was too constraining, but apparently lean towards a degree of organized guidance in the form of a chronological framework, to avoid repetition of the same periods and to give younger children a better sense of how history developed over time. The nationalism point is an interesting one though. By and large people are interested in history because they want to know the story of who they are and where they came from, which is understandable. In a setting where academics are constantly finding out more and are able to reinterpret information and change things it can be a bit surprising or embarrassing at times, but we have so much history in the UK we can sort of move on from it in a way – if we want to, that is. This is not the case in Germany, however, where people still carry the guilt for what their relations did in the war and historians have only really now started to look at that period again – between 1945 and 2005 there was a move to look back to much older German history and take social identity from that, a bit later there was more of an apologist culture where everyone wanted to take responsibility for what happened, and now people are starting to look at it again in a more detached way. The conclusion seemed to be that if you try to straightjacket history and teach all British children x, y and z about how great and liberal and wonderful we are, without getting them to ask bigger questions about why we went and stole other people’s countries or enslaved nations or disenfranchised women, you won’t teach them anything about the complexity of human behavior. How ironic that the only reason we can have this debate is because we’re one of the only countries that does separate history from heritage, giving academics the freedom to constantly reinterpret things without worrying we might lose our sense of self. Maybe Gove just doesn’t understand that, and the brilliant description of postcolonial history mentioned last night by Johnson, ‘The Empire Writes Back’, fills him with unease. Or maybe he’s just embarrassed cause he couldn’t tell his daughter which came first, Vikings or Greeks. Seriously mate, just get on Google. One thing I have found interesting this year is how things like Twitter and youtube are assisting journalists & even letting regular people report on the happenings all over the world. Especially in places where journalists are barred from entering. absolutely agree there. The amnesty talk hit on that as the journalist in Egypt was beaten up by police because he had a laptop and they automatically assumed he would use it to broadcast to the rest of the world what was going on – they accused him of being a foreign agent and stuff like that.